Engraving published in J. & F. Harwood's "Scenery of Great Britain"
(26 Fenchurch Street, London, c.1840-42); No.71. 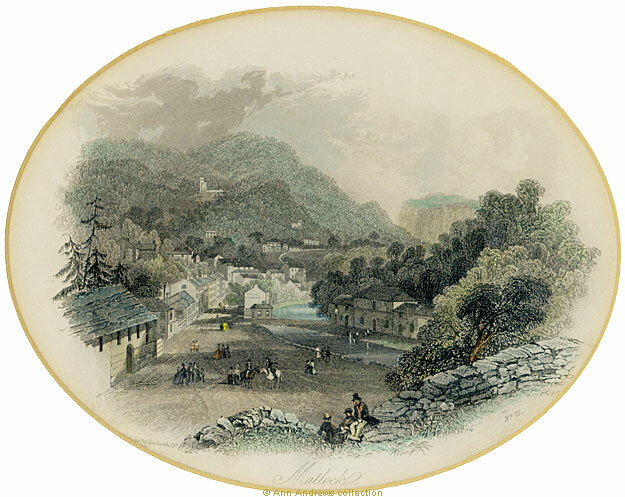 A mid 19th century vignette engraving of Matlock Bath. The village had begun to expand and here we can see The Old Bath Tap, later the Fish Pond Hotel, on the left closest to the viewer. Museum Parade extends away towards the Pitchings. The three people sitting on the wall, bottom centre, are at the top of Fish Pond Hill. 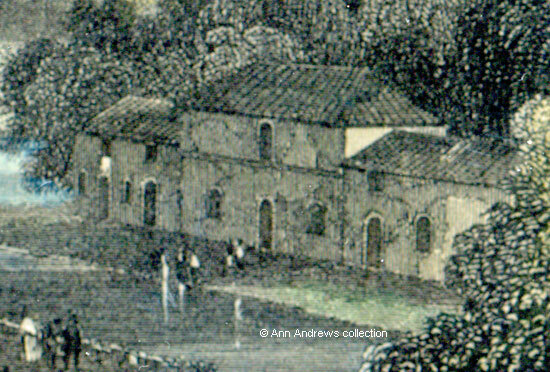 The Upper and Lower Towers, Masson Cottage, Belle Vue and probably Guilderoy are on the slopes of the Heights of Abraham, although the latter doesn't seem to be quite in the right position. The Fish Pond Stables are on the right, with quite a large expanse of water in front of them forming the fish pond. The pond of today is much smaller. On the riverbank is Buxton's Royal Museum, with the Great Petrifying Well in the small building at the side. Enlargement of the stables. Note the reflections in the pond. Engraving of "Matlock" from the collection of and © Ann Andrews. Information researched and written by © Ann Andrews. Whilst it is not know exactly which version this engraving is from, the British Library has Harwood's third series and that was published in 1842. The Old Bath Tap appears in the 1851 census.